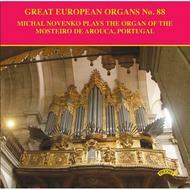 Michal Novenko plays the organ of the Mosteiro de Arouca, Portugal. In this long running series of 28 years, this is Priory’s first recording from Portugal, where few organs of worth exist. This small but amazingly versatile instrument is demonstrated in a recital of mainly Portugese organ music by Michal Novenko, who has made a large number of recordings for Priory.